About this object Speaker Joseph Byrns of Tennessee died three quarters of the way through his one term as Speaker. Democrats’ large congressional majorities grew after the 1934 elections in a potent endorsement of President Franklin D. Roosevelt’s “New Deal.” The 74th Congress (1935–1937) addressed the long-term social safety-net as the Great Depression persisted. The Supreme Court found many of FDR’s programs unconstitutional, but congressional Democrats continued passing reform legislation. Congress encouraged collective bargaining, created Social Security, regulated public utilities, and provided for rural electrification. 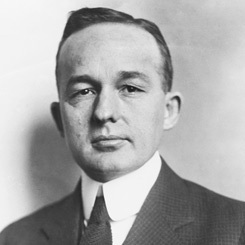 Congress also passed the Neutrality Act, which prohibited arms exportation during wartime, in response to charges that weapons manufacturers were responsible for World War I. As blistering heat sapped the American West of much-needed moisture, President Franklin D. Roosevelt signed into law a bill protecting "land resources against soil erosion." President Franklin D. Roosevelt signed the Social Security Act of 1935 into law on this date. 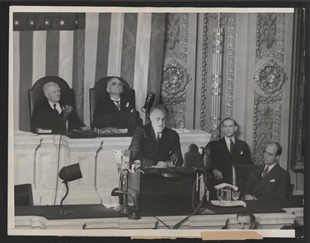 During the second session of the 74th Congress (1935–1937), President Franklin D. Roosevelt held the first nighttime Annual Message. 1Died in office June 4, 1936. 2Elected Speaker on June 4, 1936, filling the vacancy caused by the death of Speaker Joseph Byrns. 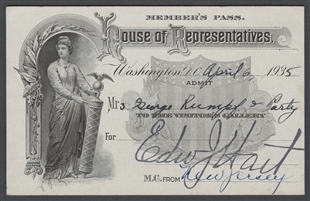 Records indicate that Representative John J. O’Connor of New York, chairman of the House Rules Committee, served as acting Majority Leader during the 14 remaining days of the 74th Congress. O’Connor does not, however, appear to have been formally elected Majority Leader at that time and, therefore, is not included in this list. At the commencement of the 75th Congress, Representatives Samuel (Sam) Rayburn, James O’Connor, John Rankin, and others competed for the post of Majority Leader. Representative Rayburn ultimately was elected by the Democratic Caucus.